Standing at an imposing 142 feet tall, Virginia's Assateague Lighthouse has been guarding the state's coastal waters for almost 200 years. Add a touch of that incredible heritage to your garden, dock, or entryway with this handcrafted wooden replica of the original! Handmade with pride by expert Amish woodworkers, this homage to the Assateague Lighthouse promises to bring both light and beauty to your outdoor garden space for years and years to come. Use the menus above to create your perfect lighthouse. If you have any questions at all, please don't hesitate to get in touch - we would love to hear from you! THANK YOU LOVEEEEE MY NEW LIGHTHOUSE! 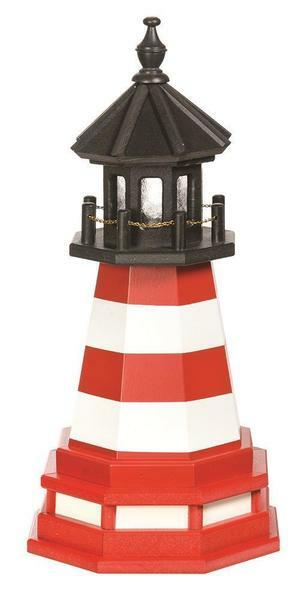 I just purchased the Assateague lighthouse, 3'. When I rec'd it I was highly impressed with the quality and craftsmanship. The lighthouse is beautiful! Thanks.